Another set from The Ton today..."City Girls Book of Life". The cute sentiment is actually from Newton's Nook "Newton Loves Coffee" set. This chick is also a stamper...as you can see I got a small spot of ink on her skirt, lol! This card is number 574 in the hop. Well, I am glad that gal can handle all that and not spill. I walk with a limp so I know my coffee would be splashed all out. LOL Wonderful card and great coloring too. 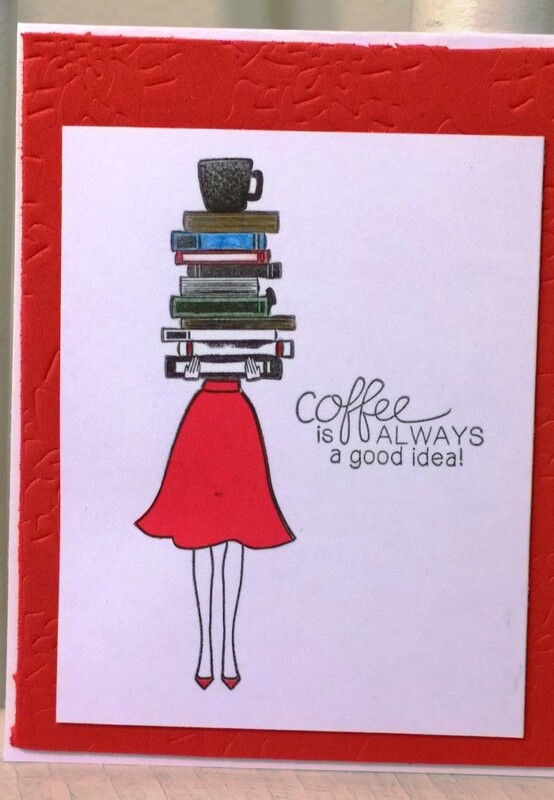 awesome card and I hope she doesn't spill the coffee. Love the red dress. If you hadn't pointed out how she stamped on her skirt I don't think I would have noticed. She looks like she is going to be a busy girl. I hope she has a nice fireplace to curl up next to, so she can sip her coffee as she reads those books. LOL. This is awesome. Such a fun card! That image could be ME....I do love books and coffee. :) Cute card. OH so cute! Made me giggle!